yeah, yeah, yeah…so i have already raved about sandwiches from north hollywood’s hy-mart deli on a couple of occasions, but that isn’t gonna stop me from doing it again. at under 7 bucks, this is the perfect cheap and satisfying meal. but don’t take my word for it…go to the valley and see for yourselves. check out this post for hy-mart’s vegetarian menu (which is pretty much all veganizable)! Mon-Fri.	11:00 a.m. – 7:00 p.m. Sat. 11:00 a.m. – 5:00 p.m.
Sun. 12:00 p.m. – 5:00 p.m.
PS: hy-mart may not be open today, i dunno. i heard it was a bank holiday or something. Wow, totally drooling before Christmas! i’m going to get this this coming week! 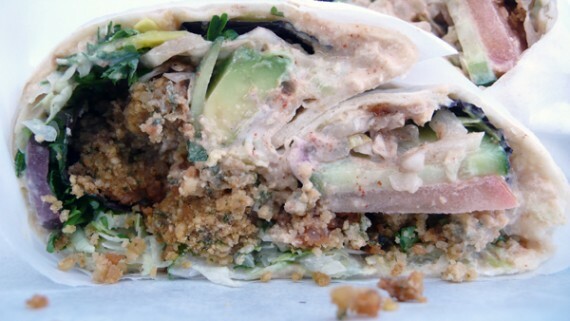 it kind of looks like the shwarma wrap at mendocino. easliy the best sandwiches in los angeles. they are huge too. if youre not *that* hungry just split one. very cool family too. support the little guy! 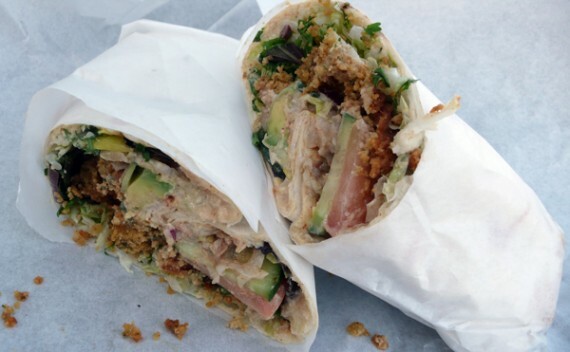 It looks mouthwatering and looks like a shawarma/kebab and i love shawarma. Just a heads up, when I was passing Hy-Mart today, I noticed that their signs are gone and there’s a notice that they moved somewhere on Vineland. If I get to it before you do, I’ll let you know what the address is. I’ve had some dance meetings by the 134 freeway near Cahuenga/Vineland recently, so I’ve stopped by Hy Mart a few times. I’ve tried the grape-leaves and hummus sandwich as well as the Bennitos sandwich (substituting hummus on the Bennitos one to make it vegan.) Quite good for a quick vegan lunch when you’re out and about in Hollywood. Not only was the shahkloot special really tasty and filling but the experience of going here was so happy. The man behind the counter took so much care in making me an awesome wrap, he suggested substitutions and verified that I was vegan. Everyone working there was friendly and it made me want to go back very soon.